Now there is this fun Striped Sleeves And V-Neck T-Shirt that is easy to combine with so much of your wardrobe. You can get this shirt in women’s sizes Small – 2XL and they are made from 91.5% polyester and 8.5% cotton making it really soft and comfortable. 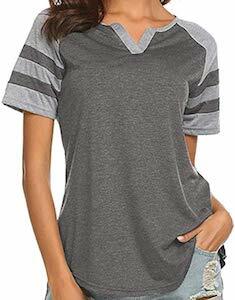 This women’s t-shirt come in a heather grey, green, and red version and the shirt has the colored front and back and the stripes on the short sleeves and the rest of the sleeves are light grey in color. And as it is a v-neck even that adds to the fun look for this piece of women’s clothing. Now you can show your love for Great Britain by wearing this Union Jack heart t-shirt. The t-shirt is available in styles for men and women and comes in sizes Small – 6XL and many colors and even a hoodie. On the shirt you can see a worn looking heart that is filled with a the Union Jack flag from the United Kingdom. 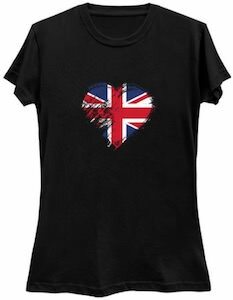 So if you like England and the flag then it would be cool to wear a fun t-shirt like this that shows the love you have for the United Kingdom all thanks to the heart. This women’s tank top shows an all American Cowboy on it. 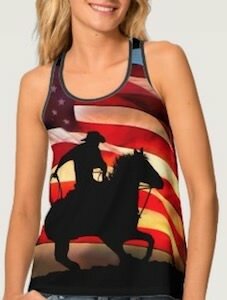 The women’s tank top has a black back and the whole front is covered in the America flag with the stars and the stripes and in front of the flag, you can see a black silhouette of a cowboy riding his horse into the night. The tank top just looks amazing as the whole front is part of the design and that makes it look stunning. You can get this cowboy tank top in women’s sizes Small – XL and it has a racerback making it just perfect for summer. 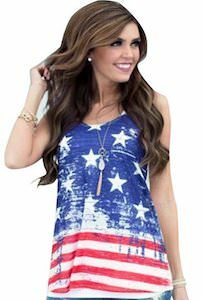 If you are looking for a tank top that is perfect for the 4th of July and any other day you like to show your love for the US flag then this tank top is it. The back of the tank top is white and it has a racerback so that you can suntan those shoulders. On the front, it is stars and stripes. The bottom part shows red and white stripes white the top is blue with white stars and it seems like there was some wet paint as the colors bleed into each other making it look even more fun. You can get his US flag tank top in women’s sizes Small – XL for the perfect fit you want. 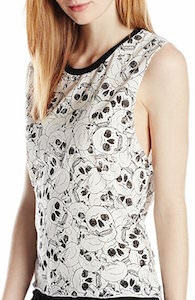 Now you can show your love of skull thanks to this women’s top. The tank top is more like a sleeveless t-shirt and is white with a black edge around the neckline. On the white fabric, you can see skulls many skulls that cover the whole fabric on both the front and back. With so many skulls it becomes almost difficult to see the skulls as it almost looks like just a fun pattern. The tank top is made from 100% cotton and comes in women’s sizes XSmall – Large. Show the world how nice a skull t-shirt can look by wearing this top. 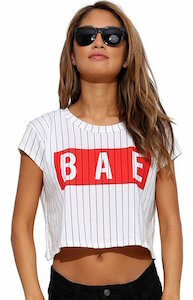 This women’s crop top clearly says “BAE” on the front and if that is you then come get one. The white t-shirt is short and will show you belly and maybe even your belly button. On the white shirt, you can see a black pinstripe on the front and back and on the front there is a big red black that says “B A E” in it which of course means “Before Anyone Else” and if you are that kind of person then this is the shirt for you. You can get this women’s crop top in sizes XSmall – 2XL and it’s great for summer. Now there is a t-shirt that warns people that there are sharks in the water. On the t-shirt you can find a circle that shows the bottom of the ocean and in it you can see two big sharks just swimming right at you. Luckily above the sharks it says “SHARK!! !” and that of course will warn people and probably keep them out the water. 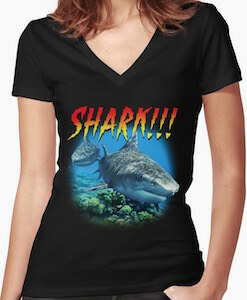 You can get this shark t-shirt in styles for both men and women and it comes in many fun colors and sizes to. No need to wear a plain t-shirt because now you can wear a shark t-shirt that everyone can appriciate. Queen Hillary that is what this t-shirt seem to be about. 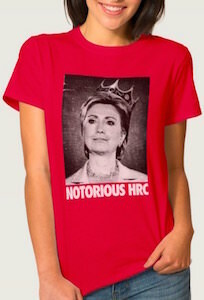 On the t-shirt you can find Hillary Clinton and she is wearing a crown and below the image it says “Notorious HRC”. It’s just a fun women’s t-shirt you need to promote Clinton. So if you like Hillary then you need to come get this t-shirt! Just pick a women’s size between Small and 3XL and a color and you are good to go. This t-shirt comes in black, blue and red. Lets replace the first black President with the first female President so come and promote Hillary for President. Does any when else find the whole Santa thing just a little bit creepy? I mean just look at the lyrics in some of the Christmas songs. This is a funny t-shirt that features the saying in green and red Christmas colors of “He See’s You When Your Sleeping… (that’s just as creepy as it sounds)”, with a strand of Christmas lights decorating the saying. You get a choice between three shirt colors of silver, cream or white and it is available in a huge selection of sizes that range from Small to 6XL so many can enjoy. It is made from 100% cotton to give you that perfect shirt that boasts both durablility and comfort. This tank top may be perfect for Halloween. The shirt is black and on the black you find in orange a skull and bones and below that the text “women’s Keep Calm And Scary On” and that seems to be dripping and that makes me wonder if orange blood exists. Sure a tank top maybe a bit cool around Halloween but that is why you can get this design in many other types of shirts as well from normal t-shirt’s to hoodies and sweaters so that you can dress for the scariest holiday of the year Halloween. 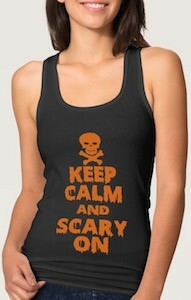 Come and take a closer look at this scary Keep Calm And Scary On Tank Top.